I sort of took a week off from knitting, ’cause yanno… I’ve been knitting a LOT lately. 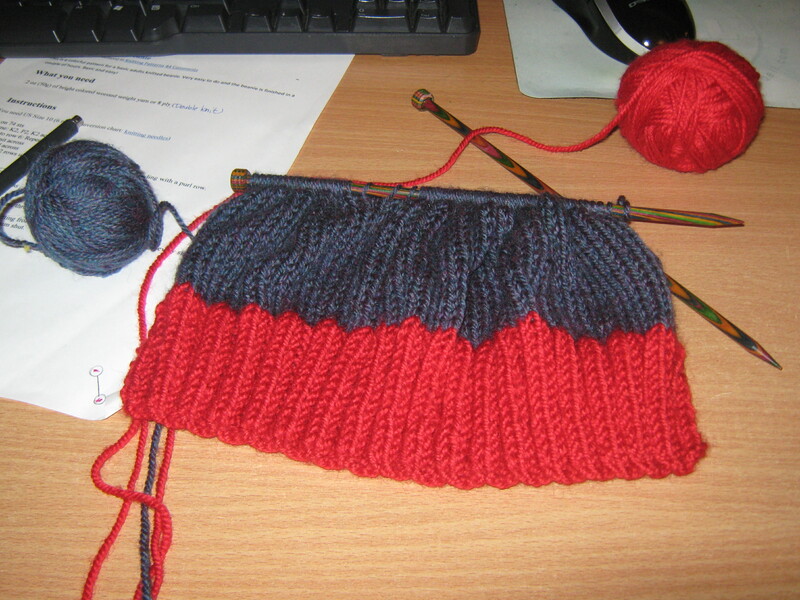 I started on a hat for myself out of the leftover red and blue yarn, and I think I will love it much much. I’m sort of making it up as I go along, and am currently debating whether or not I want to do some Fair Isle and put some sort of zig zag on it. I’ll probably just put a thin row of red somewhere along the middle… we’ll see. This is also me putting off figuring out how to knit in the round. I think I’ve got the basic idea of the magic loop technique in my head, but I can’t be bothered to work on it quite yet. I’m very low energy, low spoon, and that means I’m just sort of idly playing computer games and zoning out. Obviously, nothing wrong with that if it’s doable, I reckon! So yeah, can’t particularly complain. Well, I could find things to complain about, but they’re the everyday things — the fatigue, the lack of spoons, the lack of get up and go. Seeing how there’s little I can do about them, I figure it’s better to make peace with them and hope that perhaps, just perhaps, they’ll go away on their own.